The restaurant was almost empty when we sat down, a little late for lunch but early for dinner I guess. We got an empty seat by the window, a great view of the street outside, the waitress came not long after to take our order. I ordered a glass of red wine and a pepperoni pizza. This entry was posted in Latvia, Lithuania and tagged food, restaurant, Riga, Vilnius on May 4, 2017 by Traveltorgeir. I was very hungry when I arrived in Riga. Having left for the airport after work, then travelled on the plane for an hour, it was a long time since lunch. When I arrived in Riga all I could think of was food. My friends had arrived from Norway a few hours earlier, they had already eaten. This entry was posted in Latvia and tagged beer, food, restaurant, Riga on May 1, 2017 by Traveltorgeir. It is not always that mixing two good things leads to something better. Especialy when it comes to food. In Sweden having banana on pizza seems to be a big thing. It has never been to my liking. When visiting Kyiv I found another peculiar mix. The Ramen Burger. A burger where the bread is replaced by Ramen. The burger is prepared like any other burger, Except you replace the bread with ramen. The ramen needed to be fried a bit before serving to obtain a bread-like consistency. I was sceptical, but had to try it. Ordered my meal with low expectations, so low it would take a lot for me to be disappointed. This entry was posted in Ukraine and tagged beer, food, Kyiv, restaurant on February 13, 2017 by Traveltorgeir. I chose a vegetable soup, some local sausages and a chicken Kiev, I was in Kyiv you know. Added some bread, in one of the breads a potato and onion stew was baked into it. Cucumber mayo as a sauce. Ice tea to drink and a slice of cherry cake for dessert. A lunch large enough for me and all for only a few dollars. I found a seat at an empty table and started eating. Proper Ukrainian food at a restaurant frequented by locals. It was very tasty. I was at Puzata Hata, a traditional Ukrainian restaurant serving authentic local food. This entry was posted in Ukraine and tagged food, Kyiv, restaurant on February 6, 2017 by Traveltorgeir. There are a few differences between mainland Japanese and Okinawan cuisine. A separate country for a long time, Okinawa had time to develop their own culinary traditions, creating dishes different from those in the rest of Japan. One example is Okinawa Soba. This entry was posted in Japan and tagged food, Naha, restaurant on December 1, 2016 by Traveltorgeir. As we sat down I took one look at the meny, all written in Taiwanese, before turning to my new-found Japanese friends. ‘Can you read this?’ I asked. They stared at the menu for a while, talked Japanese among themselves, before one of them turned to me. This entry was posted in Taiwan and tagged food, restaurant, Taipei on November 3, 2016 by Traveltorgeir. I started with their blonde ale, called Prie Katedros Light. It was hot, the sun was shining, a nice, cold blonde ale seemed just right at the moment. I took a large sip. The beer was good, nothing fancy, but in the sun and heat it was perfect. A little sweet but easy to drink. I settled back in my chair, relaxed. Just watching the people around me. This entry was posted in Lithuania and tagged beer, food, restaurant, Vilnius on August 15, 2016 by Traveltorgeir. The waitress brought me the soup in bread, a huge bread, hollowed out and filled with soup. It smelled delicious. I took the top of the bread off, could see the soup. South American Lemon Beef. I picked up my spoon, tried a mouthful of the soup. A bit warm, but not too bad. And it tasted really good. 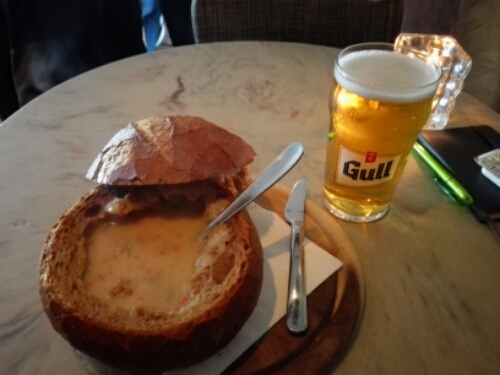 This entry was posted in Iceland and tagged beer, food, restaurant, Reykjavik on May 19, 2016 by Traveltorgeir. Winter in Sapporo can be quite cold, even for a Norwegian. There are freezing temperatures, icy winds, snow, ice. It is no wonder that the people here have found food that helps them keep warm during winter. One of them is soup curry. A curry, but also a soup. A spicy curry broth, boiled potatoes and vegetables, meat or other toppings of your choice. A powerful soup for a cold day. I always say ramen is my favorite Japanese food, my favorite food for that matter, but soup curry is not far behind. This entry was posted in Japan and tagged food, restaurant, Sapporo on March 3, 2016 by Traveltorgeir. The sign stood outside Dogo Biiru Kan Brewery Restaurant, only meters from Dogo Onsen. I had just finished my bath in the onsen, and a beer and maybe some food certainly sounded refreshing. I went inside. This entry was posted in Japan and tagged beer, Dogo beer, matsuyama, restaurant on October 29, 2015 by Traveltorgeir.